When Donald Trump confronted revelations that he used money from his charitable foundation to settle private legal disputes and purchase portraits of himself, a tireless army of tweeters went to work to keep the focus on Hillary Clinton’s foundation instead. Then Trump stumbled on a debate question about why he refuses to release his taxes, and the same army has since rushed to create the appearance of a grass-roots demand that Clinton be held accountable, instead. The accounts pumping out the tweets created the appearance of authentic outrage but had all the hallmarks of fakes, according to researchers who specialize in “bot” networks — short for robot — that shower social media with phony messages appearing to spring up from the grass roots. The pro-Trump networks tweet incessantly, but only to praise Trump and bash Clinton and the media, constantly retweeting Trump staff, pro-Trump pundits and other fake accounts, thousands of which recently added “deplorable” to their usernames. Indeed, the Clinton Foundation tweets follow a pattern of pro-Trump Twitter activity spotted by professionals throughout the campaign — accounts made to look like real people that are instead run by software and designed to amplify a certain messages — that serves to neuter negative coverage of the New York businessman. “The bot nets usually turn whatever the issue is back on Hillary,” said Phil Howard, a professor at Oxford University’s Internet Institute and the principal investigator at the Computational Propaganda Project, which has closely tracked the networks. Howard has noted the same pattern in response to stories about Trump’s refusal to release his tax returns, with bots alleging that Clinton is keeping even bigger secrets from the public. “They tend to be used to confused or muddy,” he said. In addition to fully automated bots, Trump has benefited from the Twitter activities of “trolls,” dedicated, human provocateurs, and “cyborgs,” accounts that blend automated activity with human input. Jeff Greenfield writes at Politico that Trump is echoing Pat Buchanan's 1992 message: the times are dark and the nation is under economic and cultural threat. The Republican's campaign alternately praised and blamed the moderator; insisted Trump went easy on Clinton out of respect to her family, and doubled down on his positions, such as his refusal to release his tax returns, that provided his Democratic opponent with her fruitful attacks. All in all, Trump turned a 90-minute event that didn't go that well but wasn't fatal, into possibly a three-day spotlight on the key weaknesses jeopardizing his White House hopes. It was a strategic blunder, some veteran campaign veterans concluded. "48-hour window post-debate is often just as important as debate itself," tweeted Republican strategist Kevin Madden, who experienced both the highs and lows of post-debate as top communications advisor to Mitt Romney four years ago. He needed to demonstrate fitness. 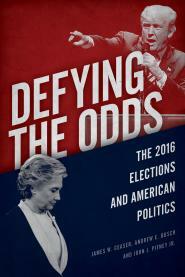 Breathing fresh life into Clinton's attacks from the debate — on his treatment of women, how he's run his business, his refusal to release his tax returns, and role in promoting the "birther" conspiracy that President Obama wasn't eligible for the White House — undermines that goal. Yet that's exactly what Trump did on Monday morning during an interview on Fox News, when he voluntarily defended against Clinton's attack that he once referred to an Hispanic Miss Universe candidate as overweight and "Miss Housekeeping." The interview ensured that the clip from the debate, among Trump's worst moments, would get replayed all day on cable news, along side the celebrity billionaire trying to defend the indefensible. Donald Trump supporters artificially manipulated the results of online polls to create a false narrative that the Republican nominee won the first presidential debate on Monday night. The efforts originated from users of the pro-Trump Reddit community r/The_Donald and 4chan messaged boards, which bombarded around 70 polls, including those launched by Time, Fortune, and CNBC. Donald Trump had one job: Don’t take the bait. But he let Hillary Clinton get under his skin minutes into their first presidential debate Monday night, first by her suggestion that he owed his success to his father’s money, and he only got more agitated as the primetime debate at Hofstra University wore on. Smiling, serene, egged on by each groan and grunt and interruption she goaded from her rival, Clinton provoked Trump again and again—over his refusal to release his tax returns, his years-long “racist lie” about President Barack Obama’s birthplace, his foreign-policy views, and his treatment of women. Meanwhile, Trump drew some blood on the issue of trade, specifically calling out crucial battleground states in the process, but found little on Clinton’s most vulnerable fronts: e-mail, family foundation and policy crises of her tenure as secretary of state. Hillary Clinton was deemed the winner of Monday night's debate by 62% of voters who tuned in to watch, while just 27% said they thought Donald Trump had the better night, according to a CNN/ORC Poll of voters who watched the debate. That drubbing is similar to Mitt Romney's dominant performance over President Barack Obama in the first 2012 presidential debate. PPP's post debate survey, sponsored by VoteVets Action Fund, finds that voters nationally think Hillary Clinton defeated Donald Trump in the debate, 51/40. Every campaign wants to claim victory as soon as possible after a debate, with the hopes that the public will buy into that claim — Clinton's team also declared the night a win for Hillary. Still, if you're on the fence about who actually "won" the first debate, you could do worse that watching GOP pollster Frank Luntz's focus group of undecided voters for CBS News. The group, in Philadelphia, broke for Clinton 16 to 5, a "bigger [margin] than almost any debate I've done in a long time," Luntz said. "This is a good night for Hillary Clinton, it is not a good night for Donald Trump," he concluded, "but there is still time and there are still undecided voters." And, he didn't have to add, two more debates. In the sprawling Clinton body politic, Shareblue is the finger that wags at the mainstream news media (“R.I.P. Political Journalism (1440-2016)”) or pokes at individual reporters. It is a minor appendage, but in an increasingly close race for the presidency, it plays its part. Donald Trump says that taxes in the United States are higher than almost anywhere else on earth. They’re not. He says he opposed the Iraq war from the start. He didn’t. Now, after years of spreading the lie that President Obama was born in Africa, Trump says that Hillary Clinton did it first (untrue) and that he’s the one who put the controversy to rest (also untrue). Since then, most have stayed on the sidelines, with 89 of the 100 top CEOs not supporting either presidential nominee, and 11 backing Democratic nominee Hillary Clinton. A total of 66 CEOs sat out the 2012 campaign, according to the Journal’s calculation. In 2006, Trump did a video to promote a book that bore his name as coauthor. (He does not actually "write" any of his books.) At one point, he explicitly denied the central idea of the Declaration of Independence. The world is not fair. You know they come with this statement "all men are created equal." Well, it sounds beautiful, and it was written by some very wonderful people and brilliant people, but it's not true because all people and all men [laughter] aren't created—now today they'd say all men and women, of course, they would have changed that statement that was made many years ago. But the fact is you have to be born and blessed with something up here [pointing to his head]. On the assumption you are, you can become very rich. Republican mega-donors continue to put their money not behind their presidential nominee but into super PACs focused on keeping the Senate and House in Republican hands. The Senate Leadership Fund, a super PAC linked to Senate Majority Leader Mitch McConnell and the Karl Rove-founded super PAC American Crossroads, raised an impressive $28 million in August, according to new filings to the Federal Election Commission. Most of the large-dollar donors to the super PAC are Republicans uneasy about their party's nominee and worried that he's dragging down the party's chances of keeping control of the Senate. Senate Leadership Fund plans to spend $60 million on television advertisements through November 2, a massive sum for one Senate-focused super PAC. The group's counterpart that played the same role in 2012, American Crossroads, raised just $7 million the August before the election - and just $37 million total for the entire cycle. Beyond the Adelsons, the Senate Leadership Fund's roster of support is full of mega-donors who don't support Trump. New York hedge fund manager Paul Singer, who is #NeverTrump, gave $1 million to the Senate-focused super PAC in August. Other #NeverTrump Republican mega-donors who contributed in August include Arkansas' Warren Stephens, who gave $500,000, Illinois' Samuel Zell, who gave $250,000, and William Oberndorf of California, who gave $100,000. When Donald J. Trump campaigned in South Carolina in December, in a crowded and tightening Republican primary, he made a pointed declaration about one of his opponents, Gov. Chris Christie of New Jersey. Mr. Christie, who was not charged, has repeatedly denied such claims. But in a federal courthouse in Newark on Monday, a prosecutor from the United States attorney’s office affirmed Mr. Trump’s view of the scandal, which helped scuttle Mr. Christie’s hopes for the presidency. The prosecutor, Vikas Khanna, said that the aides, David Wildstein and Bill Baroni, had boasted to the governor about closing several lanes of a ramp connecting Fort Lee to the George Washington Bridge. Republicans and independents are poised to play a key role in the race — if they get involved, that is, and Sanchez has made a pivot toward the right in recent weeks. The effort does not appear to be working. A statewide poll conducted for USC Dornsife and The Times this month by SurveyMonkey found 16% of registered voters, mostly self-described Republicans and independents, have decided to skip the first open U.S. Senate race that California has seen in 24 years — the same percentage of voters who favor Sanchez. Support for Harris came in at almost double that level at 30%. And more than a third of California voters indicated they still “don’t know” which Senate candidate they’ll pick on Nov. 8, according to the poll. Seventeen of the state’s 39 House Democrats have backed Sanchez, nine have backed Harris, according to the campaigns, and many of the rest said they are staying out of the race entirely. The Democrats have said they’ve tried to keep the situation from becoming awkward with a colleague many have known for decades. Among GOP House members, only Darrell Issa has explicitly endorsed Sanchez, though others have praised her. Mr. Trump’s comments were a provocative echo of widely condemned remarks he made in early August at a campaign rally in Wilmington, N.C. There, he airily suggested that gun rights supporters should rise up against Mrs. Clinton if she were elected to stop her from appointing judges who might favor stricter gun regulation. As a lot of political observers have noted, Trump’s grim-sounding language about a downcast America makes more sense if you realize just what’s happening for his rural base. And buried in the Census Bureau’s new report on income, poverty and health insurance, released Tuesday, are two piece of further bad news for rural America—trends that could keep shaping politics well after November’s election. For Americans living in metropolitan areas, inflation-adjusted household income rose by 6 percent from 2014 to 2015—a robust bounce back from the recession. But for those living outside those areas­—totaling more than 40 million Americans—household income actually fell by 2 percent. The numbers on poverty reveal a similar trend. The number of people in poverty in rural areas did fall by 800,000, but that doesn’t appear to be because people are escaping poverty: Instead, people are simply leaving. The rural population, in that span of time, declined by five million people. Taken in total, the rural poverty rate actually rose slightly, by 0.2 percentage points. In the rest of country, the poverty rate declined by 1.4 percentage points. Key swing states such as Nevada, North Carolina and Florida have seen some of the weakest income growth in the country since the last non-incumbent presidential contest in 2008, new census figures show. A Wall Street Journal analysis of state-by-state income data set for release on Thursday shows that more than half of the 13 states where the presidential race appears closely contested have seen below-average income growth since 2008. Among the eight laggards, three states saw the lowest wage growth in the U.S. during that time—Nevada, Georgia and Arizona. Following a caught-on-camera health scare for Hillary Clinton over the weekend, a new Morning Consult survey reveals widespread concerns about her health among registered voters. The poll, taken Sept. 12 through Sept. 13, shows that eight in 10 (79 percent) said they have heard a lot or some about Clinton’s health concerns. It’s a high figure. For comparison, at its height, roughly nine in 10 said they had heard a lot or some about Clinton’s use of a private email server while serving as the country’s top diplomat. Opinions on the former secretary of State’s health have already begun to shift since last month. Today, a little more than two in 10 (22 percent) say Clinton’s health is above average or excellent, down from 29 percent from a late August national survey. Additionally, 41 percent now say it is below average or very poor, compared to only 26 percent who said that in August. A plurality, 28 percent, rank her health as average (compared with 30 percent last month). There are large partisan differences when it comes to opinions on the Democratic nominee’s health. For example, seven in 10 (68 percent) Republicans said Clinton’s health was below average or very poor, compared with 16 percent of Democrats. Yet, views on Donald Trump’s health have hardly changed – 36 percent today say it’s above average or excellent compared to 33 percent in late August, despite a questionable physician’s note boasting about his health and his documented bragging about unhealthy eating. As a result Eli Stokols reports at Politico, Trump is cribbing. When Donald Trump needed a list of potential Supreme Court nominees, he borrowed one from The Heritage Foundation. His proposals on reforming the nation’s tax code and improving services for veterans appear to have been lifted almost verbatim from those of primary rival Jeb Bush. And in 39 minutes of remarks Thursday, he lifted education proposals core to Mitt Romney’s 2012 platform and a plan that bears notable resemblance to a 2014 bill introduced by Sen. Lamar Alexander (R-Tenn.). The speech, given in the cafeteria of a low-performing, for-profit Cleveland charter school run by a politically active donor named Ron Packard, is the latest example of Trump’s haphazard, cut-and-paste approach to policy — and his campaign’s eleventh-hour blitz of speeches, delivered via teleprompter, attempting to mask the candidate’s reluctance to invest in a real policy shop. Two top outside groups designed to support Senate Republicans raised $42 million in August, a massive haul that shows the fervor with which GOP donors are training their focus – and dollars – on maintaining control of the upper chamber. The gigantic fundraising number by Senate Leadership Fund and the related One Nation, groups with strong ties to Majority Leader Mitch McConnell (R-Ky.), helps underscore a driving dynamic this election: Donors, skeptical of Donald Trump and increasingly convinced he will lose in November, are turning away from the presidential race in an effort to save their legislative firewall on Capitol Hill. The two groups have raised nearly $100 million this election cycle and August – a typically slow fundraising period – was their best month. American Crossroads reported just about $2.7 million raised as of its July 2016 disclosure. Crossroads GPS, which does not disclose its donors or report its finances to the FEC, has made no independent expenditures at all this cycle and its website appears to be unchanged since June 2015. While One Nation has spent about $20 million so far this cycle in support of Republican Senate candidates, the Crossroads groups have been largely silent. In fact, $135,378 in independent attacks, by American Crossroads against Hillary Clinton, are the only reported expenditures for either entity so far this cycle. At Politico, Shane Goldmacher profiles Elan Kriegel, Clinton’s director of analytics. When Clinton operatives talk about their “data-based” campaign, it’s invariably Kriegel’s data, and perhaps more importantly his models interpreting that data, they are talking about. It was an algorithm from Kriegel’s shop — unreported until now — that determined, after the opening states, where almost every dollar of Clinton’s more than $60 million in television ads was spent during the primary. The tool bypassed the expertise and instincts of her traditional media buyers by calculating the “cost per flippable delegate,” in the words of one senior Clinton official, and then spat out what states, television markets, networks and shows to buy. Obama veterans were wowed by its advancement; internally, some Clintonites saw it as their secret weapon in building an insurmountable delegate lead over Bernie Sanders. Now, with Donald Trump investing virtually nothing in data analytics during the primary and little since, Kriegel’s work isn’t just powering Clinton’s campaign, it is providing her a crucial tactical advantage in the campaign’s final stretch. It’s one of the reasons her team is confident that, even if the race tightens as November approaches, they hold a distinctive edge. As millions of phone calls are made, doors knocked and ads aired in the next nine weeks, it is far likelier the Democratic voter contacts will reach the best and most receptive audiences than the Republican ones. Zac Moffatt, who served as Mitt Romney’s digital director in 2012, was already worried about this back during the Republican primaries. In an interview then, Moffatt feared that whoever emerged as the GOP nominee would be perilously handicapped when it came to data analytics just as Romney had been compared to President Barack Obama who, like Clinton, had honed an analytics operation more than a year in advance. Republicans have total control of the redistricting process in 20 states, including Florida, Wisconsin, Michigan, Texas and North Carolina. Democrats have total control of the redistricting process in just four states, only one of which — Illinois — is home to a significant number of Republican members of Congress. Winning back state legislative seats “will help us ensure that we have more than a seat at the table, that we’ll be able to determine what that table looks like,” said Aaron Ford, the Democratic leader of Nevada’s state Senate. Democrats have decent chances to win 11 Republican-held legislative chambers. Six of those chambers, state Senates in Colorado, Nevada, New York, Virginia, Washington and West Virginia, would change hands if Democrats are able to win only a single seat. Democrats hope to make more substantial gains in the Maine Senate and in state House chambers in Michigan, Minnesota, Nevada, New Hampshire, New Mexico and Pennsylvania. For Democrats, ending this year’s elections with 40 state legislative chambers would be a victory, party strategists say. The party plans to tie GOP candidates to Republican presidential nominee Donald Trump, who is viewed unfavorably by key voting blocs, especially white women in suburban districts. Democrats have their eyes on a few seats in Colorado’s Jefferson County, just outside Denver; the Portland suburbs in Maine; the Hudson Valley and Long Island in New York; and seats that ring Puget Sound in Washington. In this autumn of our electoral discontent, hope springs, as it so often does in the American republic, from unexpected precincts. Much of the country is distressed by the presidential candidates offered by the two conventional political parties. And for good reason. Neither Donald Trump nor Hillary Clinton meets the fundamental moral and professional standards we have every right to expect of an American president. Fortunately, there is a reasonable — and formidable — alternative. Gary Johnson is a former, two-term governor of New Mexico and a man who built from scratch a construction company that eventually employed more than 1,000 people before he sold it in 1999. He possesses substantial executive experience in both the private and the public sectors. As the nominee of the Libertarian Party, Johnson is expected to be on the ballot in all 50 states and the District of Columbia. He is, in every respect, a legitimate and reasonable contender for the presidency — but only if the voters give him a fair hearing. And that can happen only if he is allowed to participate in the presidential debates that begin on Sept. 26 at Hofstra University in Hempstead, N.Y. If the Commission on Presidential Debates wants to perform a real service to its country, it will invite Gary Johnson onto the big stage. Donald J. Trump faced a backlash on Thursday from some of his top conservative Hispanic supporters, who said their hopes that he was softening his immigration policy had been dashed by his fiery speech Wednesday night, which they said was anti-immigrant. Mr. Trump, the Republican presidential nominee, had shown signs in recent weeks that he was prepared to take a more conciliatory approach to immigrants who had entered the country illegally, dropping talk of a deportation force and instead speaking of treating those immigrants in a fair and humane fashion. A Hispanic Donald Trump supporter's assertion that without Trump there could one day be "taco trucks on every corner" in the U.S. has stirred ridicule, not to mention hunger, across the internet. Hundreds of tweets with the hashtag "taco trucks on every corner" popped up Friday on Twitter, most of them from people salivating for the tortilla-wrapped food. The social media onslaught was in reaction to a Thursday night interview on MSNBC with Latinos for Trump founder Marco Gutierrez, who said the Mexican culture is "dominant" and "imposing" before issuing his taco warning. The opportunity to poke fun at Gutierrez's remarks was too hard for many to pass up. Celebrities such as actors Patton Oswalt and Eva Longoria Baston jokingly referenced the hashtag in tweets. Various memes with statements such as "Election day is now officially Taco Tuesday" were also circulating. The Republican National Committee had high hopes that Donald J. Trumpwould deliver a compassionate and measured speech about immigration on Wednesday, and prepared to lavish praise on the candidate on the party’s Twitter account. Donald Trump swayed to songs of worship, read scripture, and donned a Jewish prayer shawl Saturday during a visit to a predominantly black church in Detroit, where he called for a "civil rights agenda of our time" and vowed to fix the "many wrongs" facing African-Americans. "I am here to listen to you," Trump told the congregation at the Great Faith Ministries International. "I'm here today to learn." Trump has stepped up his outreach to minority voters in recent weeks as he tries to expand his appeal beyond his GOP base. 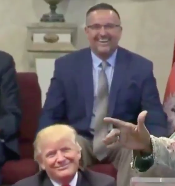 The visit was Trump's first to a black church — a rare appearance in front of a largely-minority audience for the candidate who typically attracts overwhelmingly white crowds. Trump was introduced by Bishop Wayne T. Jackson, who warned that he was in for something different. "This is the first African-American church he's been in, y'all! Now it's a little different from a Presbyterian church," he said. The latest attempt made by Donald Trump's campaign to reach millennial voters appears to have backfired, when a photo tweeted by Donald Trump Jr. quickly became material for comedians and critics online. On Friday, Trump's son tweeted a photo of him with his siblings alongside the caption, "This election is not about Republican vs Democrat it's about insider vs outsider. It's time for a change in DC!" Twitter users, comedians and celebrities had a field day with the photo, comparing the image to Children of the Corn, Mr. Robot, The Outsiders and Christian Bale's character from American Psycho, while also mocking Eric Trump's placement behind his two siblings in the image. F.B.I. officials questioned Hillary Clinton extensively about her judgment in using her private email system to discuss classified drone strikes and in allowing aides to destroy large numbers of emails, before ultimately deciding she should not face criminal charges, according to investigative documents released Friday. ■ She said she was either unaware of or misunderstood some classification procedures. ■ Colin L. Powell, a former secretary of state, had advised her to “be very careful” in how she used email. The F.B.I. documents show that an unnamed computer specialist deleted the archive of Mrs. Clinton’s emails weeks after the existence of the private server became public in March 2015.